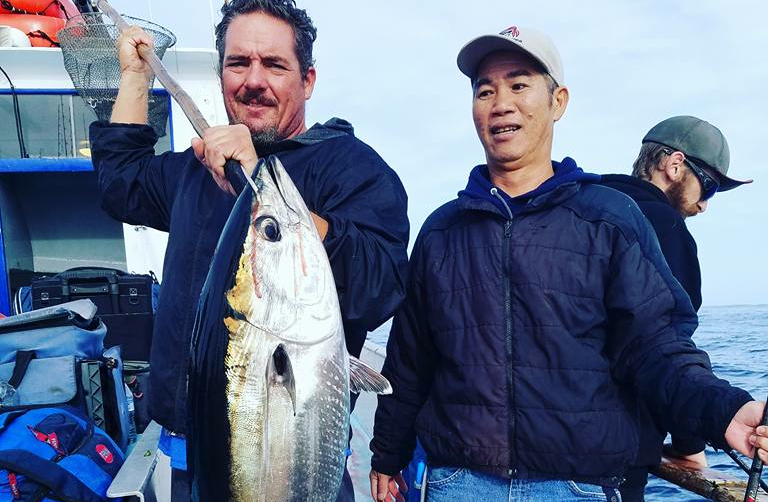 SAN DIEGO — We are well into the month of December and some anglers are probably having trouble focusing on the holidays, as there are near limit to limit numbers of bluefin tuna still biting out at the 60 Mile Bank. Who would have guessed that some of the best tuna fishing of the Southern California offshore fishing season would be going on during the middle of December? Most of the bluefin have been in the 15- to 25-pound range, with occasional encounter with 60-pound catches. The upper high spot at the 60 Mile Bank was the best zone for the bluefin and boats have been finding action while anchoring, drifting or slow trolling with nose hooked sardines. When anchored or drifting most of the bluefin are being caught on flylined sardines with a few also being caught on Flat Fall jigs. Some of the most recent sportboat counts start with Seaforth Sportfishing. A 1.5-day trip aboard Aztec returned with 21 anglers catching limits of 42 bluefin tuna and five yellowtails. Seaforth Sportfishing also had Voyager out fishing a 1.5-day trip with 14 anglers that limited out on bluefin tuna with a catch of 28 bluefin tuna. Fisherman’s Landing had Liberty out on a 1.5-day trip that caught full limits of bluefin tuna. Fisherman’s Landing also had Condor out on an overnight trip with 23 anglers that caught 44 bluefin tuna, just two fish short of full limits. H&M Landing had a 1.5-day trip on Legend return with limits of bluefin tuna, which was 36 bluefin tuna for 18 anglers. Point Loma Sportfishing had New Lo-An out on a 1.5-day trip and they had 11 anglers catch limits of bluefin tuna: 22 bluefin tuna, four yellowfin tuna and two yellowtail. Private boaters have also been getting in on the bluefin action. Capt. Ron Bowers of Salt Fever fished a weekend two-day trip and reported catching 22 bluefin tuna, which was just two fish short of limits for two days of fishing. Bowers reported finding his action while drifting over meter marks found in the deep water a short way outside of the upper high spot at the 60 Mile Bank. Bowers said their fish were in the 15- to 25-pound class and they were finding action while using live bait outfits with 15- to 25-pound test fluorocarbon leaders. What Bowers said was most important in drawing strikes from the bluefin was choosing a very strong and lively bait to put on the hook. Bowers also reported that their best time of day was from an hour before dawn until 8:00 a.m.
Capt. Bob Woodard of Christina Lynn also fished a recent trip to the 60 Mile Bank and reported catching limits of bluefin tuna by 11:30 a.m. Woodard said the bluefin were in the 15- to 25-pound range and they saw a few boils from fish that looked to be considerably larger. Flylined sardines were reported to be working best for the bluefin. A report from Condor out of Fisherman’s Landing – with Capt. John Bass – was they fished an overnight trip to the 60 Mile Bank and caught 44 bluefin tuna. All of their bluefin were caught on sardines, except for two caught on Flat Fall jigs. The suggested flylined live bait outfit was to rig with a 25-pound test fluorocarbon leader using a size 2 hook. Much of the fishing along the San Diego County coast has been in a bottom-fishing mode. The fishing along the coast has been providing some good numbers of assorted rockfish and a few bass. 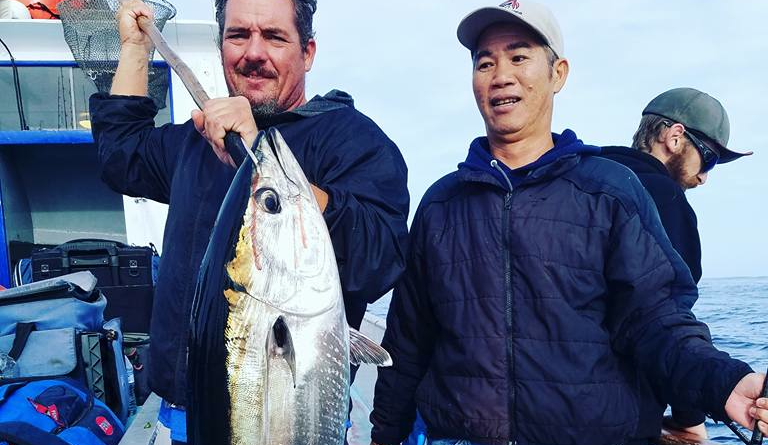 In addition to the bottom fishing for rockfish and bass there have still been some bonito and yellowtail biting in the Point Loma and La Jolla areas. Most of the bonito and yellowtail action of the past week has been reported by boats fishing outside of the stretch between the Whistler Buoy at Point Loma and the Point Loma Lighthouse but the past couple of days has seen that change with the best bonito and yellowtail action currently being reported from La Jolla. Most of the yellowtails have been in the 5- to 10-pound range, but some bigger bites to 20 pounds have also been biting off La Jolla. The bonito have been mixed size fish that have been running from 3 to 8 pounds. A good way to locate bonito and yellowtail has been by finding trolling strikes on feathers, cedar plugs and Rapalas. Another good way to locate bonito and yellowtail has been by finding trolling strikes on slow trolled sardines. A lot of anglers are taking advantage of this bonus extension of the surface fishing season being provided by Mother Nature and I hope you have a chance to get out there and get in on the late season action too! Keep on fishing and I hope to see you out on the water!